Toyota showed its new plug-in hybrid Monday, available for leasing this month in Japan, the U.S. and Europe, and promised the green vehicle for sale to regular consumers in 2011 at an "affordable" price. 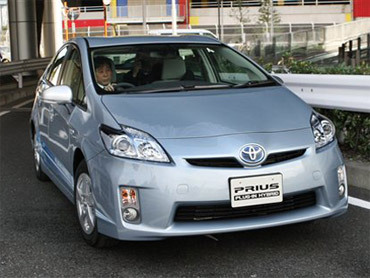 The plug-in Prius is the first from Toyota Motor Corp. packed with a more powerful battery called lithium-ion that's different from the batteries used in Prius hybrids on roads today. A plug-in is even friendlier to the environment than the regular Prius because it travels longer as an electric vehicle. Toyota leads rivals in hybrids, especially in Japan, where government incentives have made the Prius a top-seller for months. About 600 of the vehicles will be introduced in Japan, the U.S. and Europe - 230 in Japan, 150 in the U.S. and 200 in Europe - over the first half of 2010 starting this month, the company said. The customers are businesses and governments. One hundred are going to the city of Strasbourg, France. Toyota's plug-in travels 14.5 miles as an electric vehicle on a single charge, and gets 35.42 miles a liter in mileage, the equivalent of about 135 miles a gallon. Toyota did not provide a miles-per-gallon figure for U.S. road-test conditions. When the charge runs out, a plug-in starts running like a regular hybrid, ensuring drivers won't run out of power on the road. In a demonstration for reporters at a Toyota showroom, the Prius plug-in quietly glided through a small, winding course even when the driver pushed moderately on the gas pedal to reach close to 37 miles an hour. The car can reach up to 62 miles an hour. The gasoline engine part of the hybrid kicks in only when the battery runs out, or if the driver pushes too hard on the gas pedal for acceleration, according to Toyota. The plug-in recharges from a regular household socket in two hours. Toyota tests for a plug-in prototype found half the people traveled less than 15.5 miles a day. Toyota declined to give a leasing price, saying that it was being set with customers but acknowledged it was not going to make any money from the leasing. Executive Vice President Takeshi Uchiyamada said he could not give an estimate for the vehicle's price when it goes on sale in 2011, because details were still undecided and consumer demand was hard to predict. "I can only say it will be a price that will have potential buyers seeing a plug-in as a viable option," he said. "We have been working on developing efficient powertrains to be able to use oil as efficiently as possible," he said. "But many hurdles remain for alternative fuels."